In his opening remarks at Farm Journal’s Corn College last week, program owner Ken Ferrie noted “a lot of our money and our daughter go to Iowa State.” As the audience laughed, he continued to discuss his daughter’s education and, as a young woman in 2018, her consideration to enter the family farming business. What’s impossible to miss at Corn College is the commitment to education, a commitment to it by farmers and ag retailers, and a genuine investment in it by the Ferrie family and their exceptionally skilled staff. The Ferrie family launched Crop Tech Consultants, their corn and soybean ag consulting business, 25 years ago. 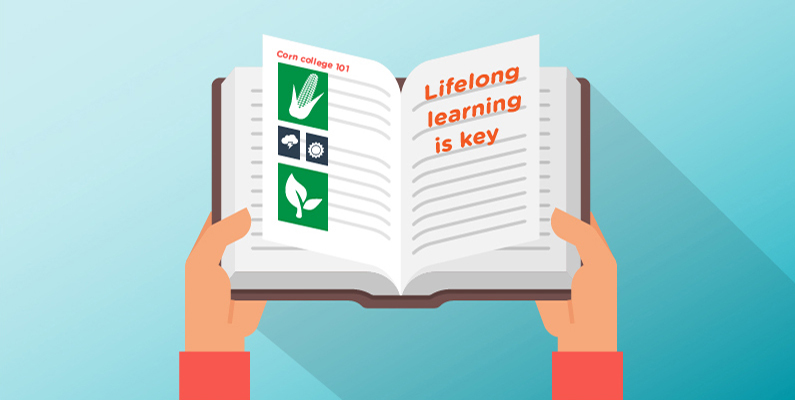 Together with Farm Journal, they have developed a day and a half curriculum of corn and soybean intensive workshops designed to teach, train and update. So how do we, as marketers, fit in and what did we hope to get out of it? Let’s back up and understand the basics of Corn College itself. Eleven years running, this series of seminars is no Corn and Soybeans 101. Though we did get a basic understanding of the soybean germination process and differentiating between vegetative and reproductive soybean stages, we hit the ground running with a seminar on corn hybrids and recognizing why hybrid characteristics matter in seed selection. In our applied learning activities, we worked with a pack of Canadian farmers and learned how their practices and decisions are different based on their geographical climate, soil and limited disease pressure. 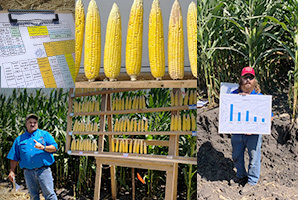 Out in the fields, we gauged how to determine replant decisions in both corn and soy, followed by a lesson on tank mixing and chemical compatibility. And that was just day one. Day two included more in-depth fieldwork, exploring the soybean fields to assess soybean development and maturity. We also learned the pros and cons of conventional till versus no-till residue management systems, as well as the correlation between organic matter and nitrogen management in plant population and yield goals. We learned very quickly that we were embedded with farmers and ag industry professionals who were there to update and further their understanding of daily practices. Some were annual attendees, for others it was their first time. A few even brought their children, perhaps a prospect of one day handing down the family farm. We’re marketers, writers, salespeople, so it’s no secret that we aren’t in the fields and working with the mechanics of ag every day. And though the research available at our fingertips by the magic of technology is invaluable, there is nothing more authentic than to be immersed in the environment with the individuals who work with this day in and day out. We know there is only so much that can be gained from a textbook and a website. So it was a privilege to be surrounded by the science of agriculture. The farmers we met, representing fifteen different states and Canada, were curious about our presence and our work. They comfortably engaged us in conversation, discussing the importance of asking them questions, not making assumptions, the value of doing research, and thanked us for being curious and open-minded about issues such as organic farming and GMOs. As marketers, it’s our responsibility to be educated and updated on our brand and the individuals that we represent. It’s also our responsibility to know our industry. Whether we are interviewing sources, researching new products or building a rebranding campaign, it’s necessary to be as informed and engaged with our community by any means possible. That means taking classes and having immersive experiences to saturate ourselves in the environment where we will gain the most knowledge and meet the individuals who can offer the greatest contribution. We might not fully understand all of the parameters or we might be surprised how much we take in. Education is priceless, and the more knowledgeable and insightful we can be, the greater the benefit to our clients. This is a guest post by Rhea + Kaiser Content Specialist Dawn Smith.